Damascus-based Hamas leader Khaled Mashaal this week warned Israel that it has one more year to recognize an independent Palestinian state. If Israel fails to do so, Hamas will "add new cards to the resistance," Mashaal told a group of young Egyptians who took part in the recent overthrow of dictator Hosni Mubarak. Palestinian news agency Ma'an further quoted Mashaal as saying the Palestinian state Israel recognizes must include 100 percent of Judea, Samaria and the entire eastern half of Jerusalem. 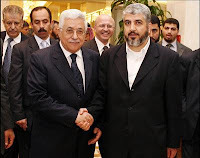 And this must come about via a unilateral surrender to Arab demands by Israel, as Mashaal and Hamas, which last week signed a reconciliation agreement with the regime of Palestinian leader Mahmoud Abbas, continue to insist they will not negotiate with the Jewish state. Israeli leaders say the reconciliation agreement and the possible formation of unity government including Hamas and Abbas' Fatah faction has effectively killed all chances of a bilateral peace agreement. Israelis also argue that the deal is further evidence of the true goals of Abbas and his allegedly "moderate" leadership. Many Americans agree with that sentiment. Last week, 27 US Senators sent a letter to President Barack Obama demanding that American financial aid to the Palestinian Authority be halted if Hamas is brought back into the government. "It is imperative for you to make clear to Abbas that Palestinian Authority participation in a unity government with an unreformed Hamas will jeopardize its relationship with the United States, including its receipt of US aid," wrote the senators. All Republican senators and about half of Democratic senators support cutting aid to a Palestinian Authority that includes Hamas. The lawmakers reminded Obama that it is actually illegal to give US aid to those listed as terrorists by the US State Department, which Hamas is. It remains important to remember that Hamas was actually elected to power by the Palestinian public in 2006. In that election, Hamas won a strong majority in the Palestinian parliament. When Abbas tried to stifle the group's power, Hamas lashed out and seized control of Gaza.